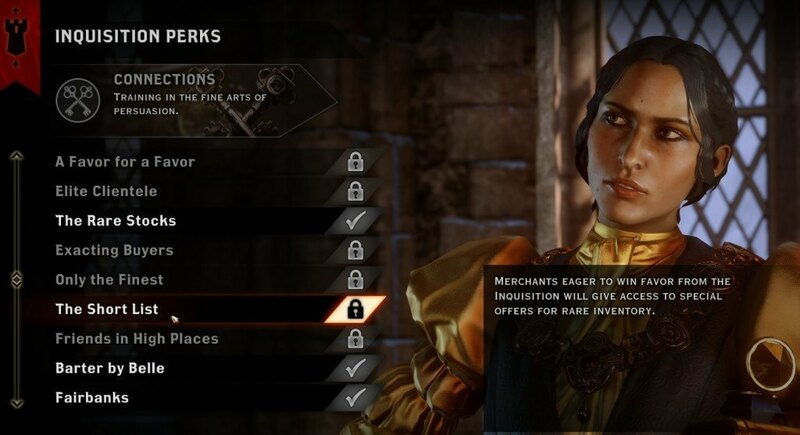 This list is for standalone, legacy Dragon Age: Inquisition, so it only lists the best gear that is available before any DLC/extra game content. 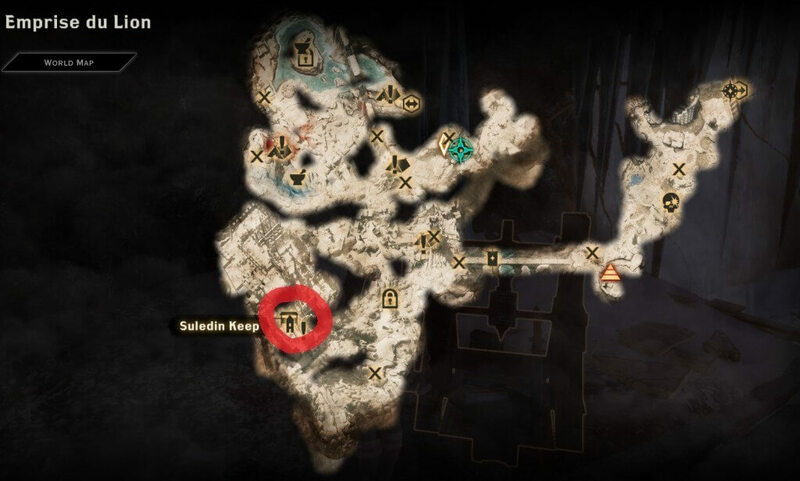 Note: if you’re having trouble finding any of the random drop schematics, try out my schematic farming method, or see if they are sold at the Black Emporium. For archer rogues, the best weapon is the Masterwork Spiked Longbow, crafted via schematic. This bow has a base DPS of 172 if you use a Tier 4 crafting material like Dragon Bone. And that’s not even including the offense and utility slots, the Masterwork material, and the Rune and bow Grip that you can attach later. 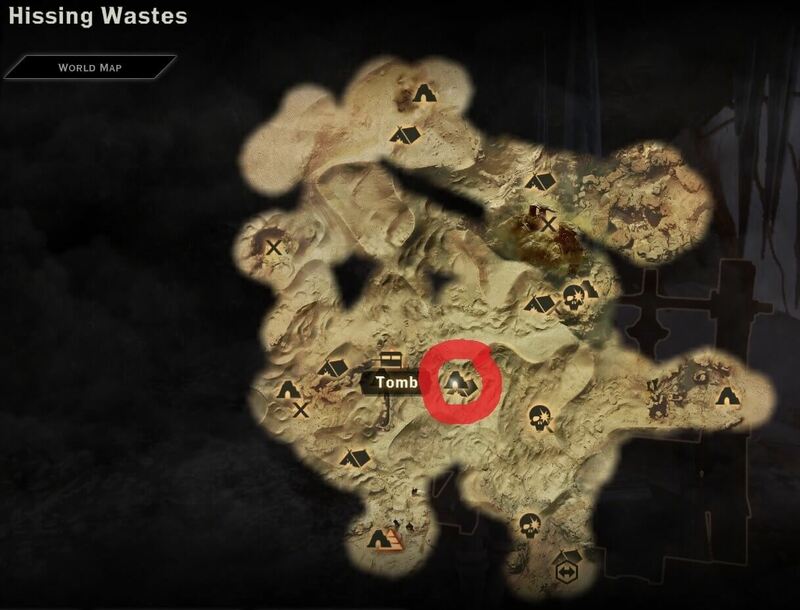 Schematic Location: Found in the Tomb right next to the Sand Crags camp in The Hissing Wastes. Map location for the schematic. I would also recommend that you pick up the unique Longbow of the Griffon from the Temple of Mythal (you can find it after doing the puzzles in the Temple and then talking to the Elves). This bow has a special effect which fires 3 arrows at a time, which is only useful against a large enemy like dragons. 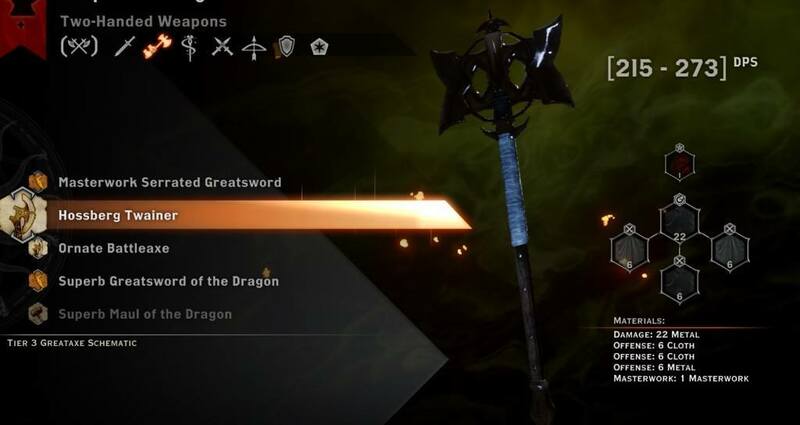 So you can switch to this bow whenever you’re fighting dragons. For dual-wield rogues, the best weapon is the Masterwork Dual Curved Blade. Craft two of these with some powerful masterworks like Fade-Touched Plush Fustian Velvet, and you’ve got yourself some serious damage. Schematic Location: This schematic is found in the Burial Grounds Tomb in southern Hissing Wastes. For mages, the Masterwork Archon Staff schematic looks good at first, but it wastes stats on a metal utility slot. The best weapon is then a tie between the Seer Staff and the Masterwork Mortalitasi Staff. The Seer staff has more offense slots which are slightly better than Utility slots for pure damage, but the Mortalitasi staff has a slightly more powerful Utility slot with 8 cloth used instead of 6, so in the end they are near equal. Schematic Location: Both schematics are random drops, although the Mortalitasi staff is definitely a lot more rare. the best 2-hander in DA: I is the Hossberg Twainer. Although it has the same DPS as several other crafted 2 handed weapons, it has 3 offense slots which makes it the best option. You can stack 3 + % attack materials in the offense slots, giving you the highest possible damage. The Twainer’s 3 offense slots make it the best choice for two-handed warriors, allowing you to stack pure % attack. Schematic Location: The Hossberg Twainer can be bought from the merchant in Suledin Keep. The Sulevin Blade unique two-handed sword is a good alternative, but if you use the best crafting materials and stack the + attack stat, the Hossberg is still ahead damage-wise. For tank warriors that use 1-handers, there are 3 crafted weapon choices: Serpent’s Rage, Griffon Mace, and the Masterwork Tevinter Longsword. They all have the same stats, but I would recommend using the Griffon Mace over the other 2 because it has 2 utility slots instead of 2 offense slots, which will give you slightly better tanking stats instead of damage stats. Schematic Location: The Griffon Mace schematic can be purchased from the merchant in Suledin Keep, but only if you have the Short List Perk from the “Connections” Perk tab. 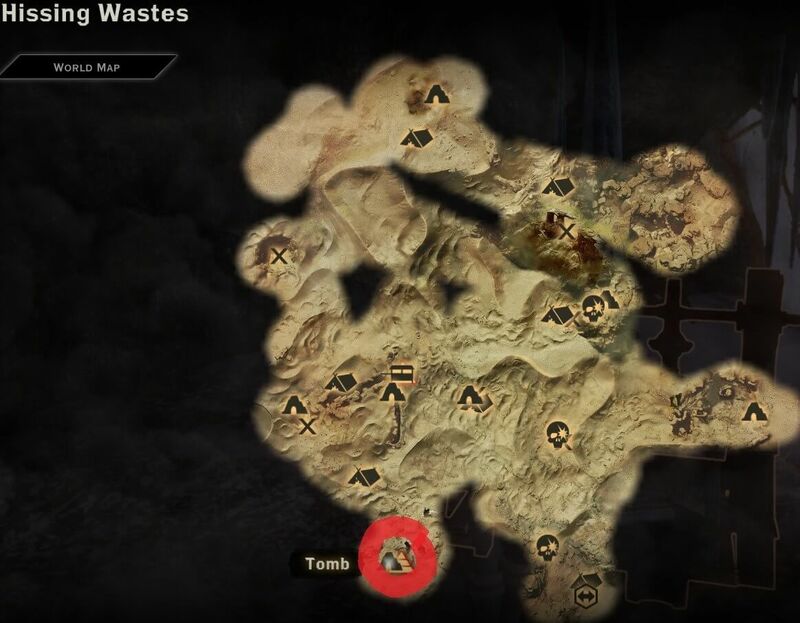 Serpent’s Rage is found in the Tomb northeast of the Statue Camp in The Hissing Wastes. 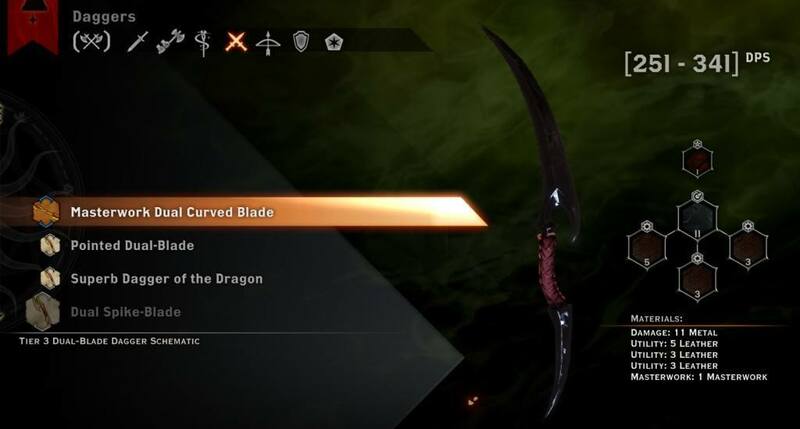 The Longsword is a random drop (and is very difficult to find, judging from what people are saying on Bioware’s forums). This perk will allow you to purchase the Griffon Mace in Suledin Keep. The Masterwork Sentinel Shield is not that great because it has a utility and an offense slot, neither of which are that great for a tank. 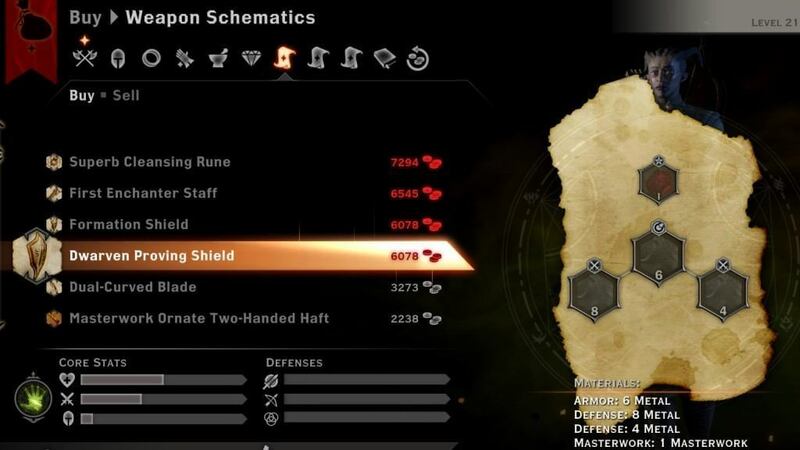 Ideally, you want to have a shield with two defense slots so that you can stack up mitigation (magic resistance, melee defense, etc). This leaves us with 4 choices: Polished Shield, Noble Shield, Formation Shield, and Dwarven Proving Shield. All 4 of these shields have 2 Defense slots, but they vary in the type of material used in these slots. Generally speaking though, they are about comparable and will give you slightly different kinds of defenses. Schematic Location: The Dwarven Proving and Formation Shields are sold by the merchant in Suledin Keep. I think that both the Polished and Noble Shields are random drops, seeing how I couldn’t find a location for them anywhere. Can somebody help me. I’m on lvl7 and reached skyhold. Where should I get good weapons and armors for me and my team. Cuz I’m the only one who is fully equipped but weak. Thanks in advance. This was incredibly useful, I’ve never really gone all out to get the MOST powerful weapons in a playthrough but I wanted to this time, and this guide was perfect! I’m on lvl7. Where should I get weapons and armors for my team. Cuz I am the only one who is fully equipped but weak, the rest are nothing. Thank you in advance. What about for Varric I wanted to use him for ages cause i like artifacers passive bonuses so any suggestions on that? Bianca’s upgrade slots are just as strong as most bows’ material slots. He’s arguably the most powerful character in the game if used correctly. I would love to see what materials are best for him i was thinking crit chance and cunning would be best for him. Definitely, but instead of going all out cunning on utility, I’d use Dragon Scales because it gives 12.5% more stats per use. @Case That logic is terrible, because if you actually do some math, you’d realize that no upgrade slots items are better for weapons. I actually think the “Staff of Corruption” schematic is the better staff, as is uses all Offensive slots, and is base 94-125 dps. Might want to look at it. It doesn’t have any upgrade slots. So, therefor = garbage.